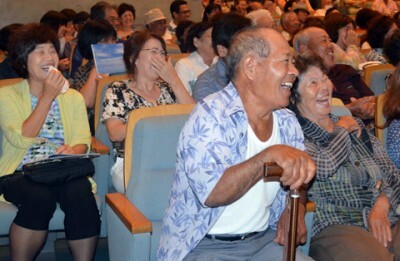 Speakers captured audiences with their humorous Miyakufutsu speeches at Matida Municipal Theater in Miyakojima on July 12. Kenan gave a speech with the title, “the golden words spoken by elderly people in Miyakojima”. He captured the audience and drew them into a whirl of laughter with his skillful pronunciation, and a humorous and important topic. It seemed almost unbelievable to local people that the foreigner has only been able to speak fluently in their dialect for just over a year. He has learned the dialect by listening to elderly people on the island where he moved from Kyoto and currently lives. Last year, he received the Miyakojima City Cultural Association’s President’s Prize at the same event. “I think Miyakojima dialect is suited to speaking. By using it, one can easily express pleasant meaning and nuance. I would like to learn more to be able to speak expressive and beautiful Miyakufutsu. The speech contest is held annually to deepen understanding of the dialect, which forms the base of culture, and to share the richness of expression of Myakufutsu with the next generations. Other winners are as follows: Superintendent Award of Education Board, Geoge Kakinohana, President Prize of City Cultural Association, Seikichi Shimoji, Miyako Mainichi Shimbun Prize, Katsunori Sunagawa, Miyako Shimpo Award, Atsushi Yonaha, Miyako TV Award, Yukiyo Tamayose, and President Prize of Miyakojima Tourism Association, Kumiko Kinoshita.